There’s a little plastic baggy that contains the neck, gizzard, liver… and I’m not even sure what else. I’ve always heard of gizzard gravy, but our cats end up with these pieces. There’s 2 of each of the other pieces. When we first started doing this I was expecting the breast pieces to be cut down the middle. But they’re actually cut horizontally just above the wish bone, which my customers that used to butcher for themselves tell me is the old-fashioned way of doing it. The only other tricky thing is telling the back pieces from the breast pieces. But if you flip them over, you can tell the back pieces because you can see the rib bones underneath. The breast pieces will just be meaty. I used a book called Fix Freeze Feast. It has freezer cooking recipes in 6 main categories: Chicken, Beef, Pork, Meatless, Marinades, and Breakfast & Snacks. Great recipes that are pretty simple and straightforward and generally use basic, unprocessed ingredients. The only tricky thing for me is that our meat is usually frozen, and the recipes call for fresh unfrozen cuts. So I’m sure to plan ahead and make the time to do this right after butchering, before the chickens are completely frozen. The first recipe I did is called Urban Garlic Chicken and involved a couple of whole chickens instead of the cut-up ones. 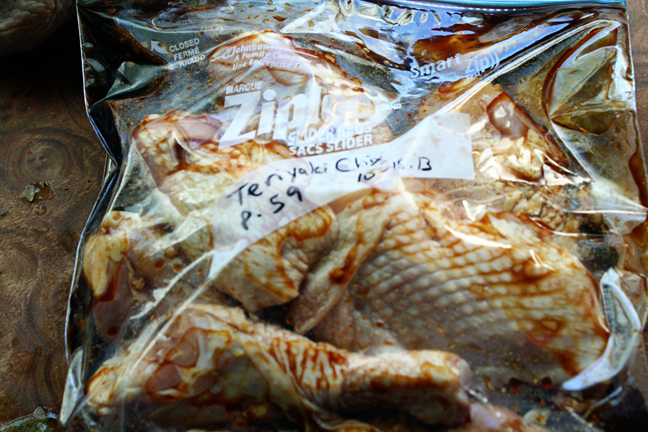 The whole chickens have the gizzard baggie tucked into the cavity, so be sure to remove that first. 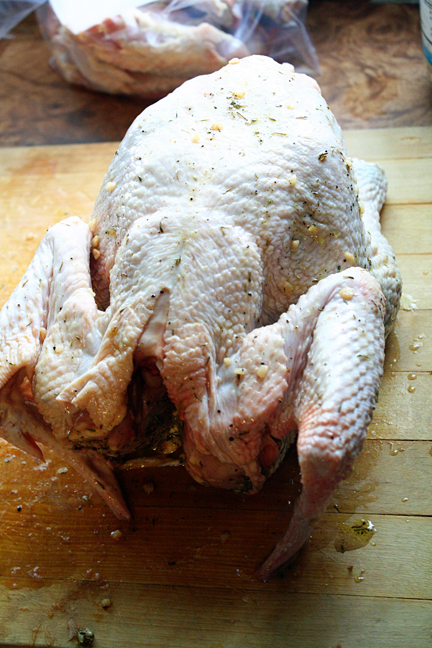 Then I just rinsed off the chickens, patted them dry with paper towels, and rubbed the recipe’s herb & garlic marinade underneath the skin, inside the cavity, and all over the outside of the chicken. 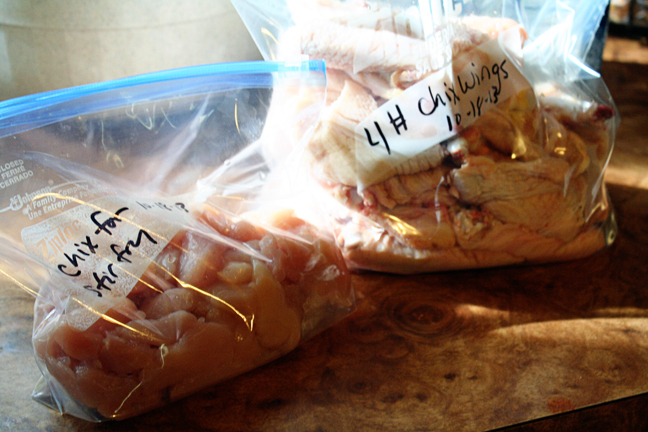 Then each chicken goes into a gallon freezer bag, labeled and right into the freezer. Then I started working on the cut up chickens. I used 8 of these. I threw all of the wings together into a cake pan and came back to them later. I threw all the back pieces plus the contents of the gizzard bags into another pan to feed to the dogs and cats. 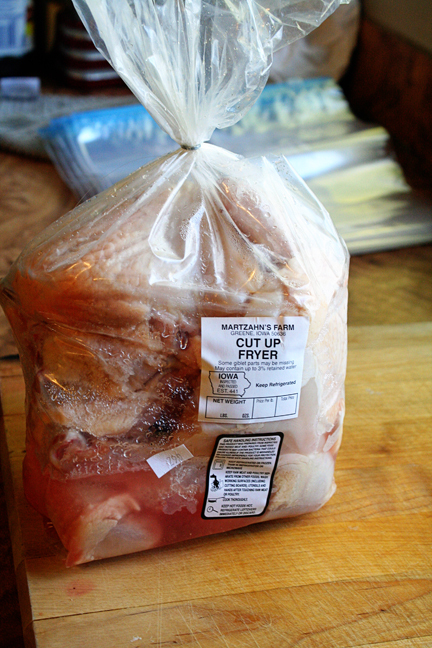 Sometimes I’ll throw the back and neck pieces into a freezer bag, which I’ll pull out later and boil for chicken stock. But right now I’ve got several older whole chickens in my freezer that I plan to boil instead. So the back and neck pieces went to the dogs this time. Next I divided the leg and thigh pieces between 4 freezer bags. So each freezer bag had 4 thighs an 4 drumsticks. I’ll come back to those later, too. Then I took the breast pieces, pulled the skin off, and de-boned them. I started with the larger breast pieces and slid my thumb between the meat and the bottom bone to separate them, then used my knife to cut each breast away from the center breast bone. Finally I used the knife to cut the breast away from the remaining bone around the edges. 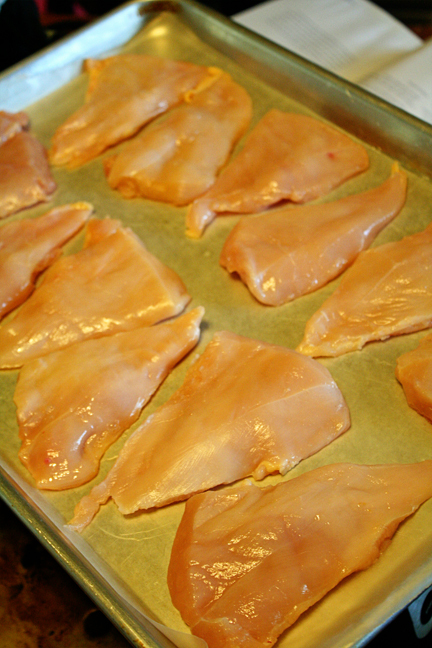 After you get the larger breasts de-boned you’ll see a chunk of meat underneath each breast piece. I cut that off, cut it into smaller pieces, and had a pan of “stir-fry pieces” going. (I used a lot of pans!) It’s hard to describe. De-boning is just one of those things you have to do a couple of times until you get the hang of it and get a rhythm going. I considered making a video, but I hadn’t showered so that idea was nixed. Then I do the same with the smaller breast pieces. These also usually come apart into 2 main pieces plus a few smaller pieces that get added to my stir-fry pile as well. Now it was back to the thighs and drumsticks. I mixed up two different marinades from the book: Honey-Glazed Chicken Thighs and Teriyaki Chicken. 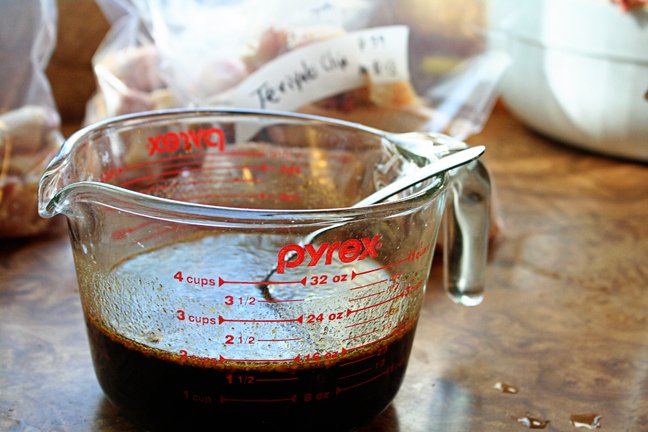 Each marinade made enough for 2 bags of chicken, for a total 4 meals. I labeled each bag with the date, the name of the recipe and the page number it came from in the cookbook. That way, when I want to use them, I can easily look up the directions on how to prepare them. Finally I pieced out the chicken wings. I simply bent them “backwards” at the main joint and then cut apart the “wing” and the “drummy” pieces. Then I used a sturdy pair of kitchen scissors to cut off the wing tips. Those went to the dogs, too, and the wing & drummy pieces went into a bag. It ended up to be about 4 pounds of wings from the 8 chickens. I’ll probably hang onto them until Super Bowl time. 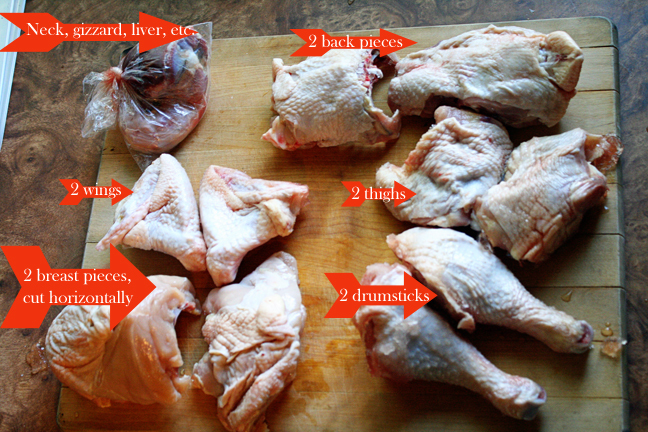 So to sum up this rather long post… I ended up with 2 whole Urban Garlic Chickens; 2 bags of Honey-Glazed Thighs & Drumsticks (8 pieces in each bag); 2 bags of Teriyaki Thighs & Drumsticks (8 pieces in each bag); 4 pounds of wings; half a quart bag of stir-fry pieces; 16 large breast pieces and 16 small breast pieces; and a whole lotta dog food (or you can boil these for chicken stock, and freeze the stock.) Not bad, and having those in the freezer ready to go is such a time saver! This entry was posted in How to Cook. Bookmark the permalink.